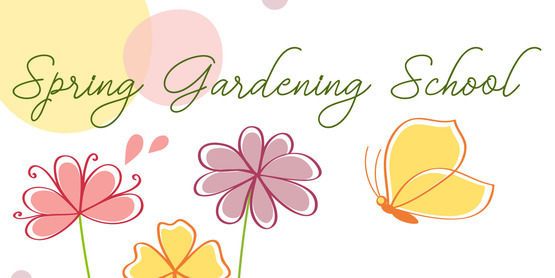 It’s Not too Late to Join our Spring Gardening School! Join us for our full day of Gardening Workshops at Suffolk County’s annual Spring Gardening School on Saturday, April 13, 2019. Organized by Master Gardener Volunteers for the last 37 years, this beloved event kicks off the growing season for hundreds of gardeners who gather together for a day of learning and fun. This year’s Spring Gardening School will be held at the Riverhead Middle School in Riverhead, NY. All classes are taught by Master Gardener Volunteers, Cornell Cooperative Extension Educators and local experts. 2C- What’s Wrong with This Picture? EXPM 4: Pruning Roses and Hydrangeas: No More Flowerless Plants! Classes fill quickly! Download the brochure here which has the registration form to mail back to us. We look forward to seeing you there! 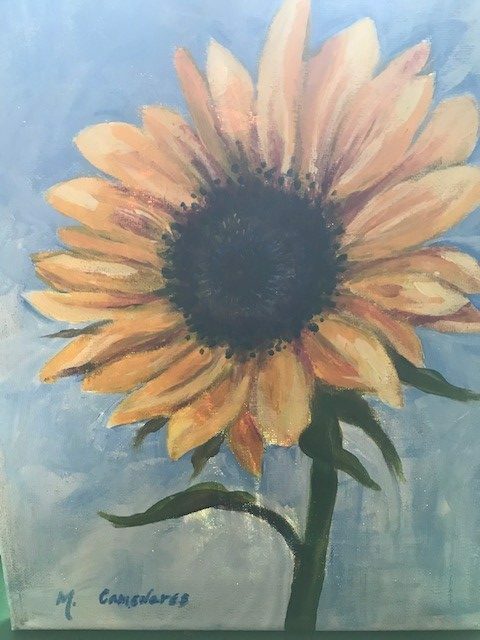 This entry was posted in Flower gardening, Growing food, Horticulture Diagnostic Lab, Indoor plants, Insect pests, Invasive plants, Lawn care, Long Island gardening, Master Gardener Volunteers, Native plants, Plant diseases, Sustainable landscapes, Uncategorized, Vegetables, Waterwise gardening, Wildlife habitat on March 15, 2019 by dmc72. Have you ever wanted to take the “Master Gardener” course but were unable to attend daytime trainings or have time to volunteer? CCE Suffolk is now offering an 8-week online for our gardening community, based on the horticultural research and experience of Cornell University specialists and experts in their field. The Advanced Training for LI Gardeners (ATLIG) offers many of the same horticultural topics included in the Master Gardener Volunteer training, including botany for gardeners, soils, beneficial insects, composting, vegetable and fruit gardening, lawn care, plant diseases, climate resilient gardening, managing wildlife, pests and much more. Visit our website at http://ccesuffolk.org/gardening/gardening-workshops for ATLIG schedule and registration information, as well as information on our annual Spring Gardening School. The online course will begin on February 19 and end April 14, 2019. There are no sessions to attend in person. Contact Donna Alese Cooke at dmc72@cornell.edu for more information. Limited space is available. This entry was posted in Uncategorized on January 25, 2019 by dmc72. Photos of trees in varying stages of health are not a new thing for the Horticulture Diagnostic Lab to receive. Homeowners often contact us wanting a diagnosis of their sick or “dying” tree. 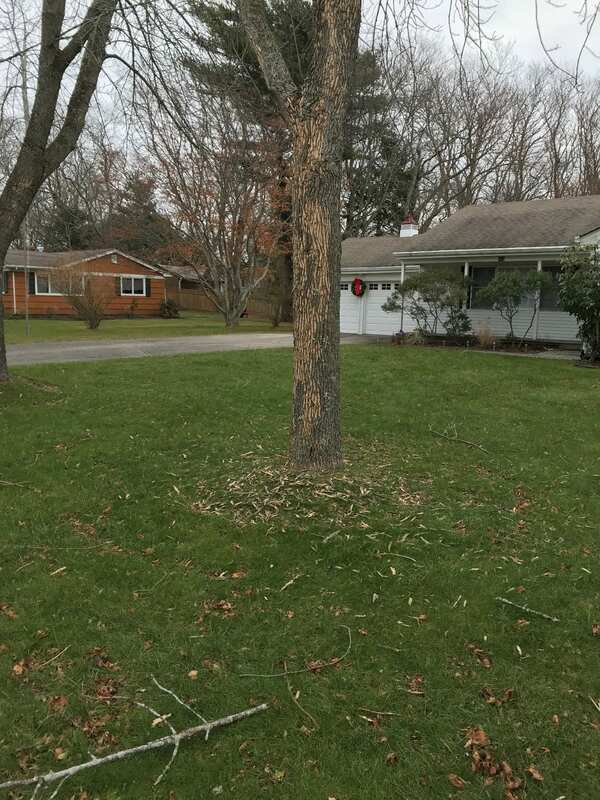 I recently responded to an email from a homeowner from the north fork of Long Island, inquiring about borer holes on three deciduous trees, and I requested he send photos. When the photos arrived, the injury to the trees was unlike anything I had seen before; extensive woodpecker activity called “blonding” (see photo below). 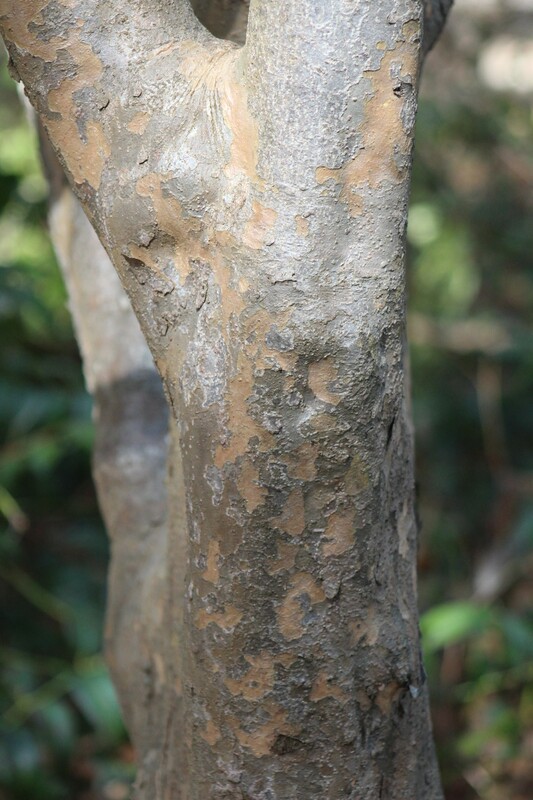 The trees have furrowed bark, opposite branching and a somewhat weeping habit, which is characteristic of ash trees, and although I wasn’t able to see the emergence holes from the photos, my heart sank. This had to be the workings of an insect called the Emerald Ash Borer (EAB), which up until now had not been found out in Suffolk County. Confirmation of the tree species as ash and identification of EAB followed just a few days later by our local Cornell Entomologist Dan Gilrein. EAB has arrived. With no known sightings of this insect in any other parts of Suffolk or Nassau counties, one wonders how did this insect found its way all the way out to the north eastern part of Suffolk County with no stops in between? 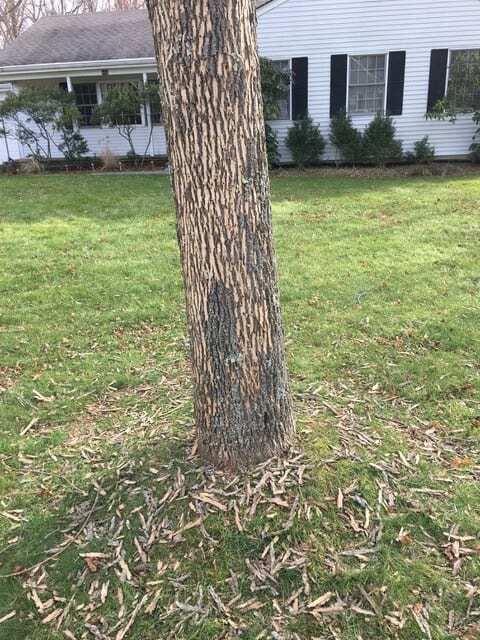 Ash trees do not make up our native forests here on Long Island, but varying species of ash (genus Fraxinus), have been planted as street trees in many locations and planted on homeowner properties as well. The movement of infested firewood, much like other invasive insects such as the Asian Longhorned Beetle, or diseases such as Oak Wilt, is the most likely answer. Human activities provide the transportation for these hitchhikers. In the community where the insect was found, many of the homes are second homes or vacation homes, so perhaps firewood was brought in from another location where EAB is well established. I’m writing this to hopefully make more people aware that it is illegal to move firewood more than 50 miles from its source and that by law untreated firewood cannot be brought in to New York State. For more information about the specific regulations pertaining to moving firewood you can click on the following link to the New York State Department of Environmental Conservation website; https://www.dec.ny.gov/animals/44008.html. Don’t contribute to the growing spread of destructive invasive pests. Protect our trees! At the time of this writing it isn’t known the extent of the EAB infestation here in Suffolk County, but as always our Horticulture Diagnostic lab is here to help! Emerald Ash Borer can also attack a related species of tree called the fringetree which is a very ornamental flowering tree. For specifics on this highly destructive insect pests please feel free to visit the New York State Department of Environmental Conservations website for their EAB fact sheet here; https://s3.amazonaws.com/assets.cce.cornell.edu/attachments/34998/EAB_DEC_early_detection_brocure.pdf?1546628049. This beetle is difficult to detect before extensive damage has been done, so if there are valued ash trees on your property you should likely consider protecting them with the appropriate pesticide. The New York State Department of Environmental Conservations press release regarding the finding of the Emerald Ash Borer can be found here; http://www.dec.ny.gov/press/115854.html. If you suspect you may have EAB on your property or are having a problem with you trees, feel free to give us a call. You can find our contact information here; http://ccesuffolk.org/gardening/horticulture-diagnostic-labs. This entry was posted in Uncategorized on January 14, 2019 by dmc72. With the year drawing to a close and cold weather settling in, our diagnostic lab in Riverhead remains busy. This year has been a banner year for boxwood blight, with the lab seeing over 85 positive samples come in. The humid weather throughout the summer, followed by a particularly rainy fall created the perfect environment for this disease to thrive in our landscapes. 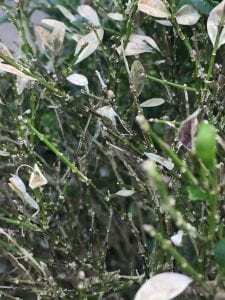 Green stems that are defoliated. 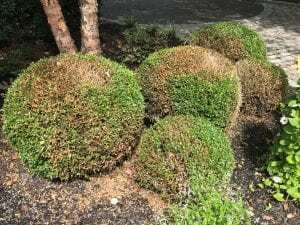 To prevent this disease from striking your boxwood, we recommend not planting new boxwoods, or, if you do, only purchase plants from a trusted source. Only use clean pruning tools when shearing or pruning your boxwood. Tools can be disinfected by cleaning with a 10 percent bleach solution (9 parts water to 1 part bleach)- wipe off tools to remove debris, soak for 10 minutes in 10% bleach, and rinse in clean water before use. Leaves that fall from boxwood are small and sticky – be vigilant of leaves attached to shoes, gardening gloves and tools. Make sure your boxwoods are sited in the appropriate conditions: full sun with good air circulation, irrigated with soaker or drip hoses and not overhead irrigation. Boxwoods are more likely to become infected in continuously wet conditions. If your boxwoods are looking unthrifty, it doesn’t necessarily mean they are infected with boxwood blight. Contact us at the Horticulture Diagnostic Lab with photos and samples. 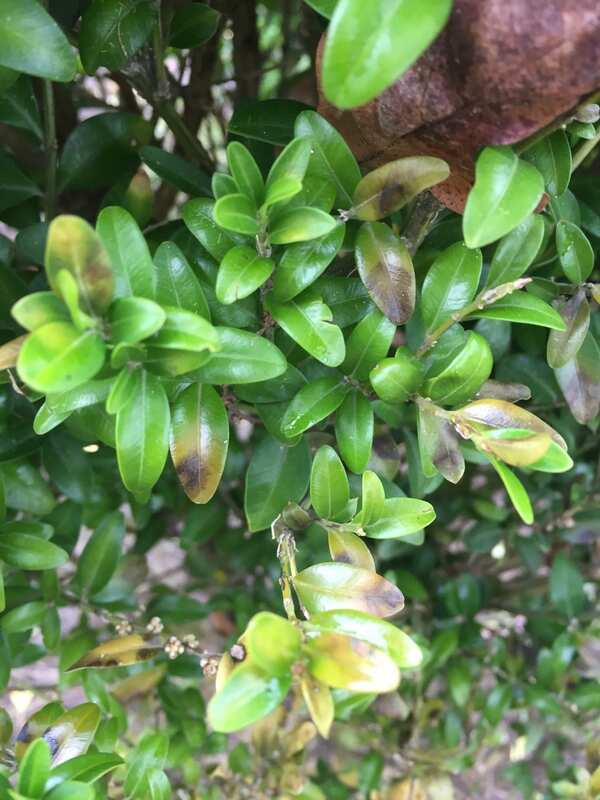 Our publication here, Photographic guide of Boxwood Pests & Diseases on Long Island, will help you troubleshoot the common problems we encounter. Should your boxwood fall victim to boxwood blight, your best course of action would be to pull out the plants and destroy them. 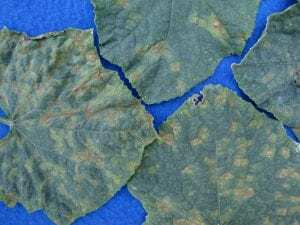 Fungicides may help protect plants from new infections but they are costly and diligent applications are necessary and not always successful. Severely pruning back plants can be helpful, but with the slow growth-rate of boxwoods, you may be looking at a sad plant for a long time. Until effective management solutions are discovered, your best bet will be to think outside the box…wood. You can find some good alternatives on our factsheet. This entry was posted in Uncategorized on December 14, 2018 by dmc72. Suffolk County residents who enroll in this course are welcomed to join our local Suffolk CCE Community Action group, where we will provide educational resources and additional in-person trainings that address Gardening in a Warming World. Contact Donna Alese Cooke at dmc72@cornell.edu to learn more about our local Suffolk CCE Community Action group, and the upcoming free in-person classes that will be available to Suffolk County residents participating in the “Climate Change, Science, Communication and Action” online course. This entry was posted in Uncategorized on September 10, 2018 by dmc72. What are those Webs in the Trees? Fall webworm is all around on Long Island now. Our Diagnostic Lab is getting many complaints about a wide variety of trees and shrubs with lots of webbing, defoliation and browning leaves. 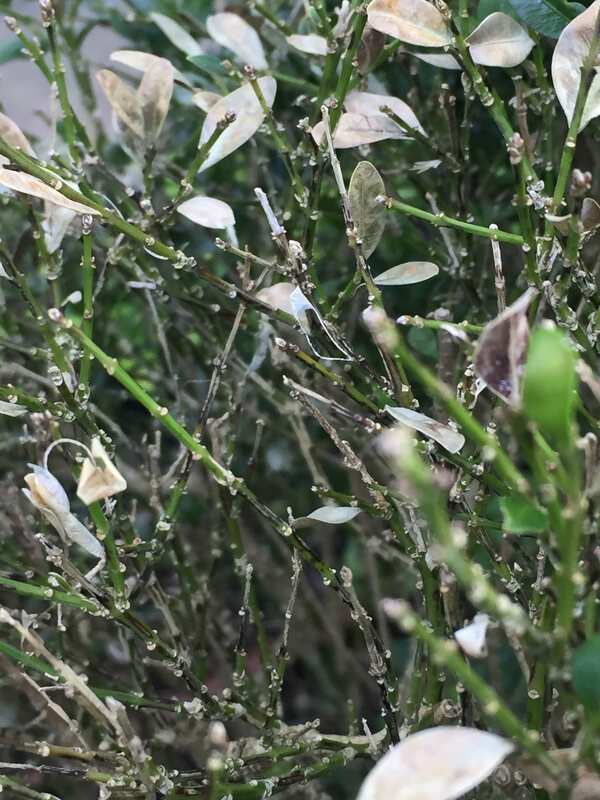 According to Sandra Vultaggio, Horticulturist in our CCE Suffolk Diagnostic Lab, this pest has been particularly successful this year in part due to the high humidity we’ve experienced. Since this is a late-season pest it does not tend to affect the health of the tree. It is more of an aesthetic issue when the brown leaves and webbing occur. For this reason we do not often recommend pesticides. Once the caterpillars are finished feeding, which takes roughly 6 weeks, they will fall to the ground to pupate over winter. It may be wise to do a thorough fall cleanup of leaves and debris around the trees this year. Dan Gilrein, Extension Entomologist adds that some herbaceous plants are affected as well. Some may confuse this with gypsy moth, which doesn’t produce webbing and is not active this time of year, or (eastern) tent caterpillar, which is active in spring mainly on cherry and apple, ornamental varieties of these, and some related plants. 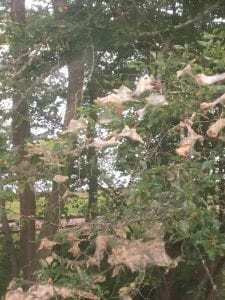 Fall webworm is a native insect and its populations go in cycles. It’s wide host range includes over 400 plants. This particular ‘outbreak’ is the largest he has seen, though similar (short-lived) population explosions have been observed elsewhere. Fall webworm levels were high in parts of the Adirondacks last year, for example, but have since collapsed for the most part. Dan is not sure know why these population swings occur, but they probably have to do with direct and/or indirect impacts of environmental conditions on the insect, its natural enemies, and possibly its hosts. Remove webbing and caterpillars by hand which will improve the appearance immediately. Prune out infested branches. This is the last alternative, as it can damage the plant, spoil the appearance, and open wounds. Contact a consulting arborist or landscape professional for assistance, who can assess and handle the job. This entry was posted in Uncategorized on September 6, 2018 by dmc72. Be on the Lookout for these Vegetable Garden Diseases! Look out for these garden diseases! See symptoms? Please report! 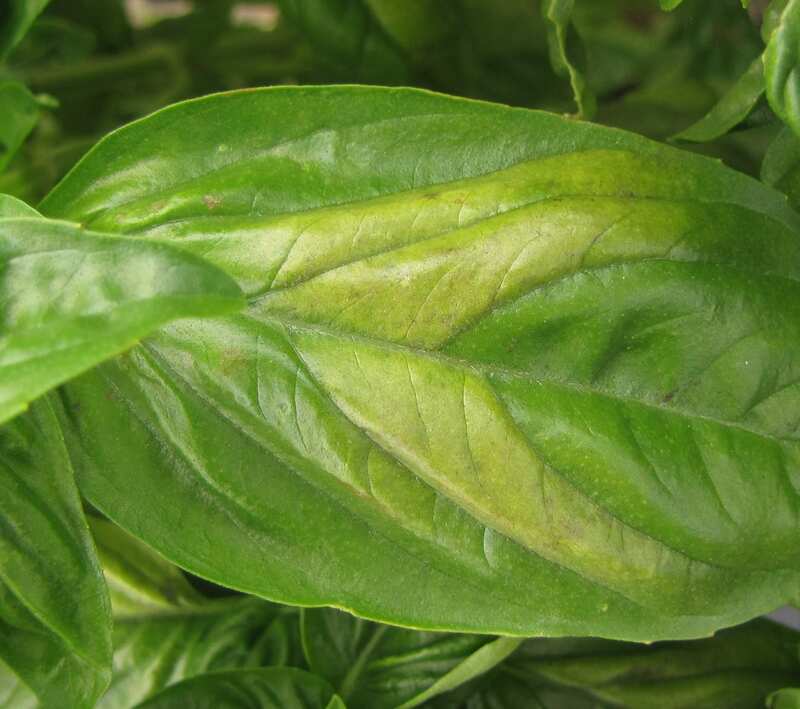 Occurrence of a couple important diseases of vegetables and basil is monitored in the USA every year to be able to inform growers when they need to be prepared for them to develop in their crops. Their occurrence is variable and impact is great, thus the importance of monitoring, which is done primarily by plant pathologists working with growers. Gardeners can access this information, thereby also benefiting, and they can play a very important contributing role by reporting when these diseases occur in their gardens. Some gardeners already have been! 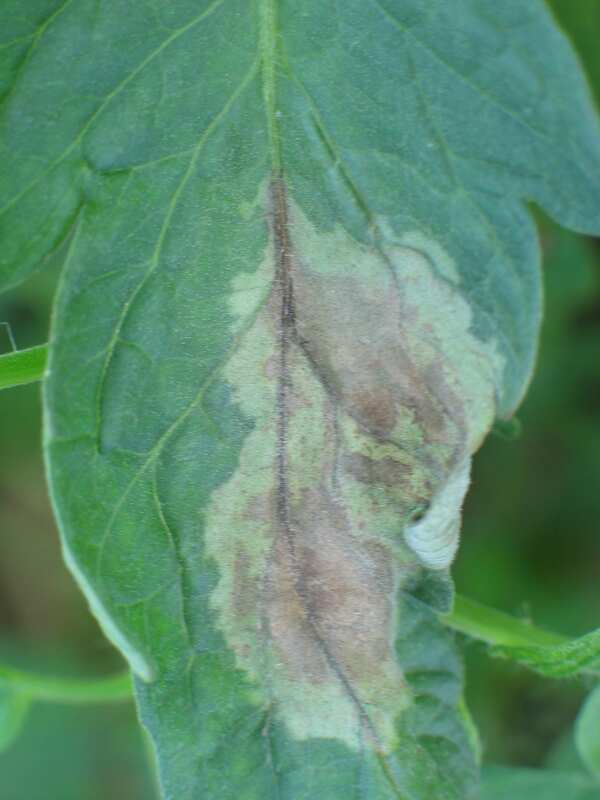 I have lots of photos to help with identifying these plus other diseases at: http://blogs.cornell.edu/livegpath/gallery/ and information about them at http://blogs.cornell.edu/livegpath/extension/for-gardeners/. Make sure to take photos to document your report. Late blight of tomato and potato. Occurrences are mapped at http://www.usablight.org/. 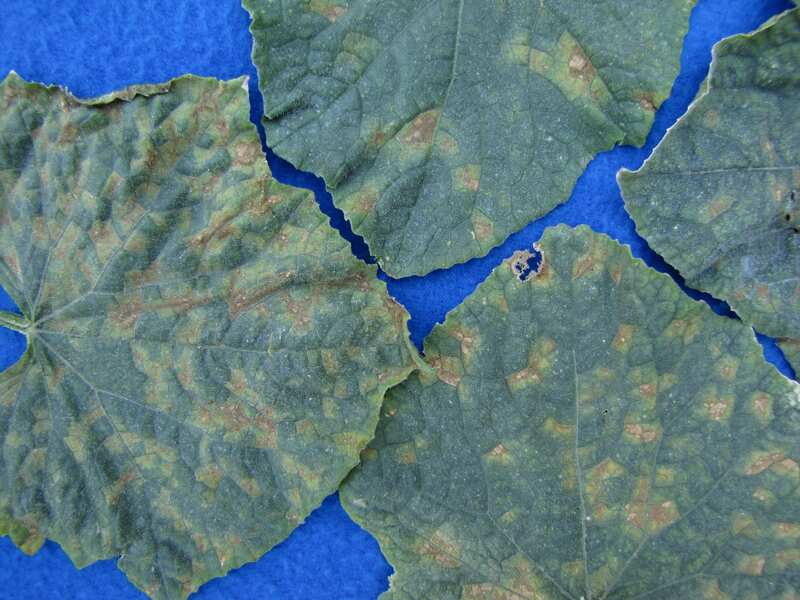 At this webpage anyone can sign up to receive alerts when late blight has been confirmed near them; the alert system is not just for growers. Downy mildew of cucumber, squash and other cucurbits. In addition to information about occurrences, at http://cdm.ipmpipe.org/ there is a map-based forecasting system predicting where the pathogen is likely to develop next. There is also an alert system gardeners can utilize. Downy mildew of basil. Reporting presently is done to a spreadsheet at https://docs.google.com/spreadsheets/d/1lHTfaVYxjjr7CxbEJiv8qgYmB5VdMFdT_4ehfjQrc5U/edit#gid=0 A map-based webpage is being developed similar to that for the other two diseases. Take advantage of these great resources, and please contribute reports to increase the value of monitoring and our knowledge about occurrences of these important diseases. Dr. Meg McGrath is an Associate Professor at Cornell University’s Long Island Horticulture Research and Extension Center in Riverhead, New York. This entry was posted in Uncategorized on July 2, 2018 by dmc72. No need to wait until you retire to take the Master Gardener Training program! New this fall, CCE Suffolk will be offering an online, hybrid training program that is designed for you to learn at your own pace, while easily fitting into your busy schedule. Starting in September of 2018, the program will include all of the horticultural topics and hands-on training needed to become a Master Gardener Volunteer for Suffolk County Cornell Cooperative Extension. Monthly weekend in-person trainings will take place one Saturday each month from September 2018 through March 2019. Now is the perfect time to take the first step, and join our very dedicated group of expert gardeners! See our new brochure to learn more about the Master Gardener Volunteer program. Download the application for the 2018-2019 training here. This entry was posted in Uncategorized on May 22, 2018 by dmc72. With spring rapidly approaching there’s no better time to appreciate the silhouettes of our trees, especially those with attractive bark. This is a valuable ornamental feature often overlooked. 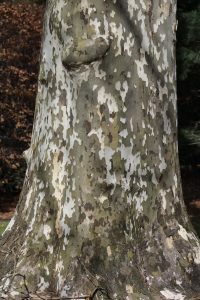 While you are likely familiar with some of the larger trees that have striking bark, such as American or European beech, American sycamore or London Plane tree, there are many trees suitable for smaller landscapes which will catch your eye. Perhaps you are familiar with Stewartia psuedocamelia, or the other Stewartia species which have white camellia-like flowers in the early summer. But did you know that as they mature they develop an exfoliating bark in a patchwork of copper, tan, olive and lavender? 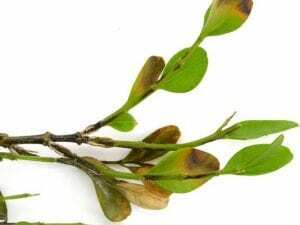 Stewartia spp. are typically pest free and offer fall color too. Every yard should have one! 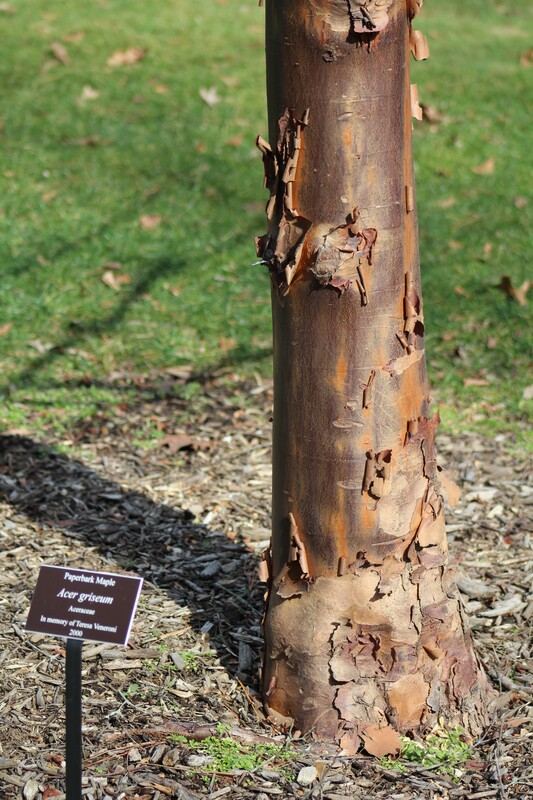 Another tree offering bark in similar colors are the Crape Myrtles, Lagerstroemia indica hybrids. Crape myrtles are widely known for their late summer flowers in shades of pink, red, purple and white. When looking for a crape myrtle for your landscape select varieties best suited for our colder winters and then chose a flower color. Maybe you have a wet site where many trees do not do well. I have just the solution for you, and it has attractive peeling bark to boot! The tree I’m referring to is called a river birch, Betula nigra. Young trees have papery bark in shades of cream, salmon, orange brown, and cinnamon brown which peels freely. 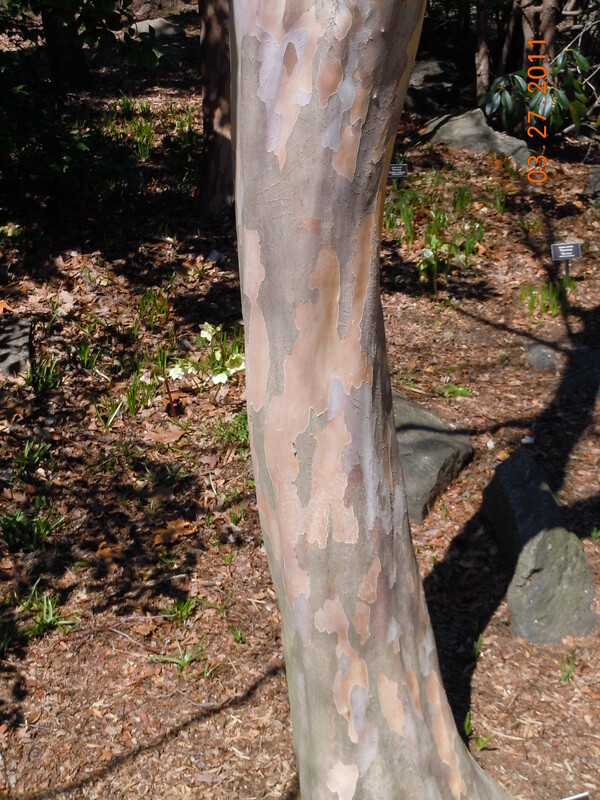 As the tree matures the trunks become dark reddish brown to gray-brown in color with plate-like scales. 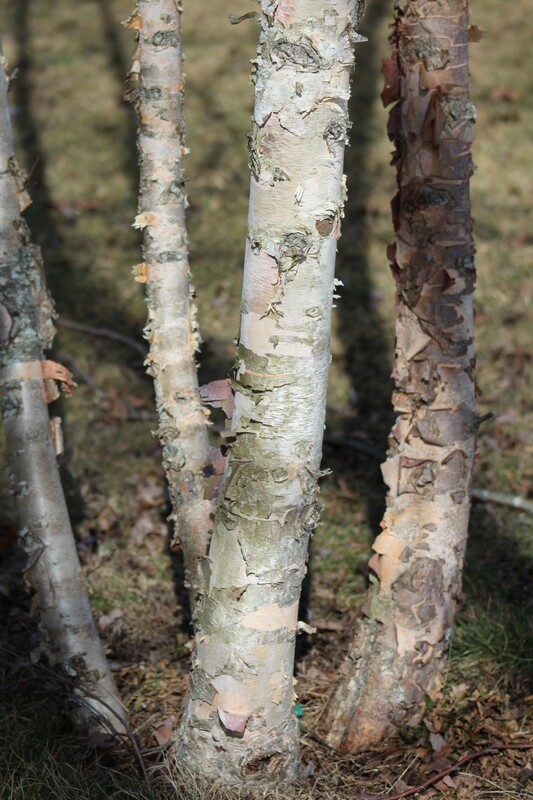 River Birch also boasts resistance to the bronze birch borer, a devastating pest of many other beautiful birch trees. 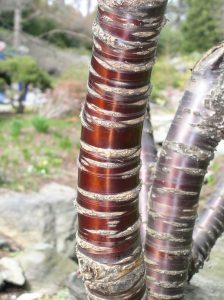 A lesser known tree with highly ornamental bark is the Paperbark cherry, Prunus serrula. Much like most other flowering cherries, its white flowers are short lived and it may be prone to disease and insect pests, but the bark is incredible! 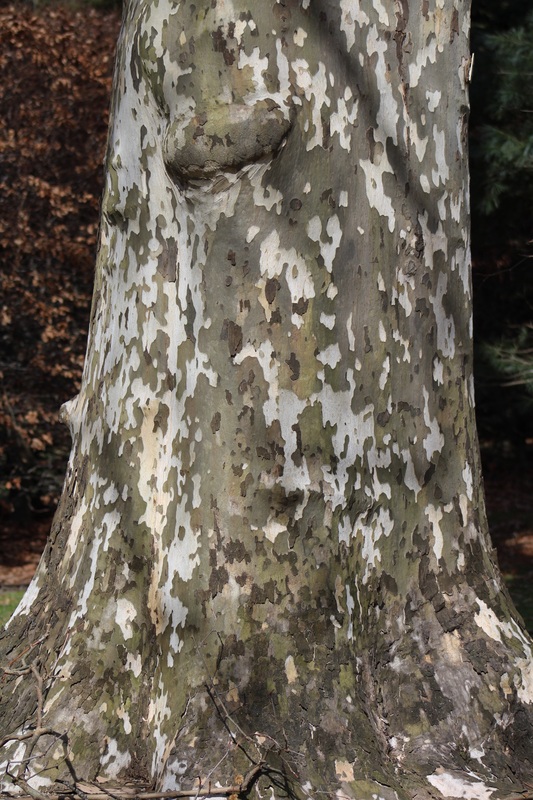 I came across this tree in the New York Botanical Garden and was wowed! 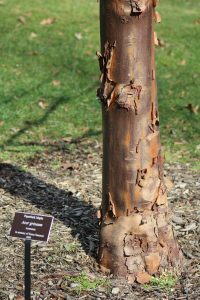 The bark is a glistening coppery red-brown, looking more like polished copper than living bark. I’m still contemplating including this one in my own landscape despite the pest management it will likely require. Before leaves and flowers emerge this spring, get out and really look at your trees. Botanical gardens and arboretums are a great place to see some of these trees and others that are especially beautiful in winter. Take notes and photos. Consider planting one or more of these trees with beautiful bark to give your landscape four season appeal! This entry was posted in Uncategorized on February 7, 2018 by dmc72. Join us for Suffolk County’s annual Spring Gardening School on Saturday, April 14, 2018, 8:30 a.m. to 4:00 p.m. 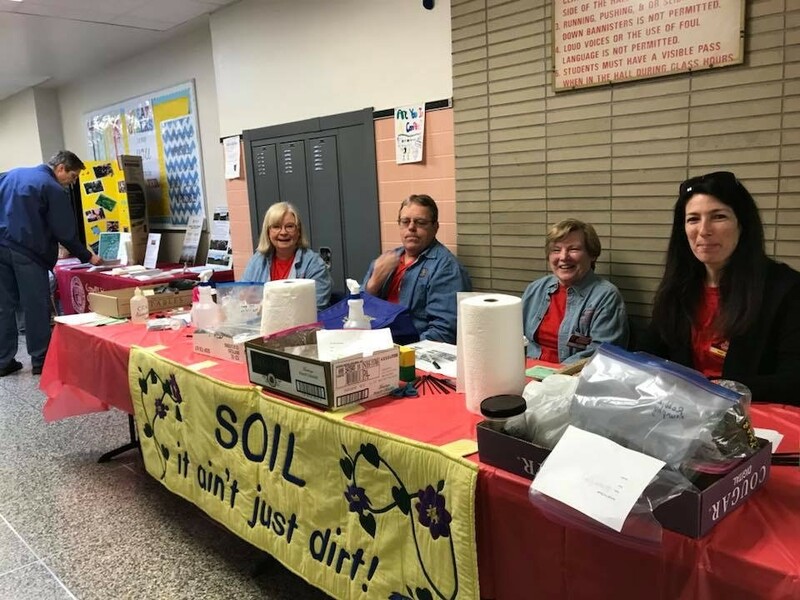 Organized by Master Gardener Volunteers for the last 36 years, this beloved event kicks off the growing season for hundreds of gardeners who gather together for a day of learning and fun. Spring Gardening School 2018 will be held at the Riverhead Middle School in Riverhead, NY. All classes are taught by Master Gardener Volunteers and Cornell Cooperative Extension Educators. The day consists of workshops held during three sessions and offers classes for beginners to advanced gardeners. This year a keynote address on “The High Line: Lessons for Your Garden” will be presented by Roxanne Zimmer Ph.D., Master Gardener Volunteer from Peconic. You can sign up for such classes as School & Community Gardens 101, Gardening in Deer Country, Edible Landscaping, Gardening in Small Spaces, and many, many more. This year, you can choose to create hands-on take home projects such as Botanic Art (see project below), Nature’s Colors in Your Hands (plant dyes), Make & Bake Herb Bread & Butter, Floral Arranging, and The Art of Bonsai. The fee to attend is $65 per person ($60 early bird, before March 1st), which includes free soil pH testing, a plant diagnostic clinic, gardening exhibits, and an early plant sale from some of the finest nurseries on Long Island; continental breakfast, delicious boxed lunch, raffles, and door prizes. Pre–registration is mandatory; first come is first served. This entry was posted in Uncategorized on January 29, 2018 by dmc72.